It’s been a slow week in the history of maritime medicine–an opportunity to reflect about other things. Well, maybe there was some history-of-naval-medicine news of note: the release of a new book “Battlefield Angels” by Scott McGaugh (see a review of the book here). It’s a popular history of American medical and not-really-medical people who suffered and sacrificed to give aid to comrades fallen in combat since our War of Independence and up to Afghanistan. That former U S Navy Surgeon General Vice Admiral Harold M Koenig wrote the book’s foreword is significant: there are many maritime medical connections in the book. Chapters with significant navy medical historical content include “Fighting Infection-World War II: The Pacific“, “Battle Burns-World War II: Iwo Jima” and “Helos and Hospitals-Vietnam War“. I purchased my electronic copy last week for just $0.99, but I see that today, the price has jumped to the electronic standard $9.99. I’d be happy to post a review of the book if any of my readers would like to write one. Of late I’m being wakened in the middle of the night by ruminations on the tragedy of the Battle of the Java Sea at the outset of World War II. I had my attention drawn to the forlorn battle (as Winston Churchill wrote of it in The Hinge of Fate) when I did a post on the story of Dutch hospital ship op ten Noort (March 2011) during, and in the months and years after the battle. One very early Japanese war priority was to secure the abundant oil resources–essential for her war effort–in the Dutch East Indies, especially the island of Java. To this end, she mounted a three-prong naval approach on the entire chain of islands now known as Indonesia, sending fleet elements and invasion forces south through the South China Sea, the Makassar Strait and the Molucca Sea. Facing this onslaught of modern and efficient forces (including abundant naval and land based air assets) was a ragtag fleet of American, British, Dutch and Australian cruisers and destroyers with no organic air forces, quickly thrown together in less than a month. While Dutch commanders were committed to a fight-to-the-end defense of their colonial territory, their allies were less enthusiastic. The Americans in particular were ambivalent about supporting Holland in her efforts to preserve control over colonial possessions. The British, who had only recently lost Singapore in a humiliating defeat, had little enthusiasm for continuing the fight in the area. The Australians were presumably a bit more committed. The ABDA Command was stood up on 15 January 1942, with U S Admiral Thomas C Hart as Commander Naval Forces serving under Supreme Commander (British) Field Marshall Sir Archibald Wavell. From the outset, communications among the allies was less than ideal. Less than a month after the ABDA Command was established, upon the urgings on the Dutch government in exile, the Americans pulled Hart out. He was replaced by Dutch Vice Admiral C E L Helfrich, himself born and bred in the Dutch East Indies. Helfrich’s naval subordinate, Dutch Admiral Karel W F M Doorman, was from the outset placed in command of the newly established Combined Striking Force. Among the problems Doorman faced were–in addition to the lack of air assets previously noted–a bilingual (multilingual if you include the Indonesian personnel serving in the Dutch ships) force with different electronic communications gear, no common codes or even flag signal protocols, no radar, and no time to even work out a set of tactical policies. This force went bravely out to face overwhelming odds to try and delay or prevent the Japanese invasion of the Dutch East Indies. Fighting blind, with no air support, in old and already battle-damaged ships with exhausted crews, Doorman faced superior Japanese forces possessed of air power (with airborne spotters) and heretofore unknown oxygen-fuelled “Long Lance” torpedoes that had more than four times the range of British and US devices, and that left no track of bubbles that might permit potential victims a chance to see and avoid them. From the outset, Doorman’s Combined Striking Force suffered one disaster after another, while being absolutely ineffectual in its few attacks on Japanese naval elements. The main battle, 27 January 1943, and subsequent actions in the next day, resulted in the sinking of every ship in Doorman’s fleet, save four old U S destroyers released early because they had expended all their ammunition. 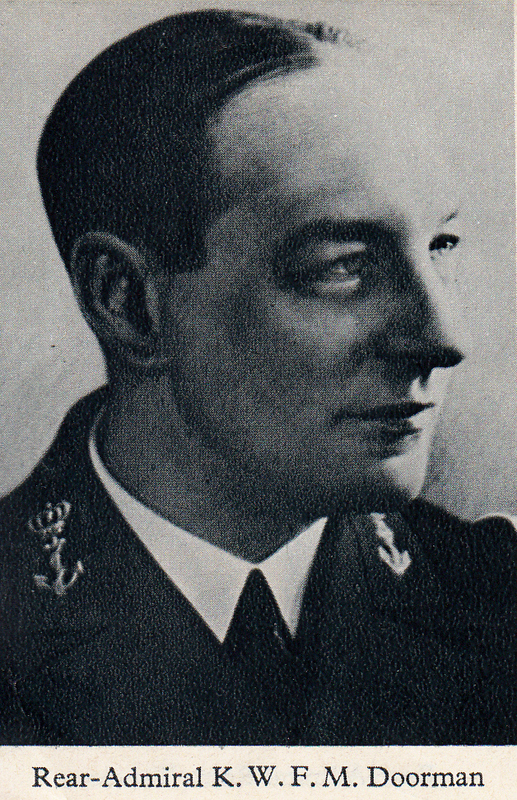 The gallant but doomed Admiral Doorman went down with his flagship, the cruiser De Ruyter. More than half of his crew perished, and this was typical of all the ships sunk, including the British cruiser Exeter and the American cruiser Houston. For their gallant but futile actions, Doorman and the men in his commanded delayed the Japanese invasion by fewer than 24 hours. The Royal Netherlands Navy have named three ships for Admiral Doorman, the last a multipurpose frigate of the Karel Doorman class. Commissioned in 1991, the ship was sold to Belgium in 2007 and now serves in that nation’s Naval Component as Leopold I. The Karel Doorman monument at the center of the Netherlands’ Kembang Kuning war cemetery at Surabaya in the Indonesian province of East Java commemorates the Battle of the Java Sea. And, another Naval Cemetery story. It is traditional that U S Naval Cemeteries come under the purview of U S Naval Hospitals, presumably under the doctrine of “If you can’t cure them, then you’re responsible for burying them”. Thus was the case with the Naval Cemetery on Mare Island, California which had its first burial in 1854. The Mare Island Naval Hospital closed in 1957, and it’s not clear to whom care of the 900+ grave property then fell until 2002, when title to the Cemetery devolved to the City of Vallejo, California. The cemetery lies within a National Historic Landmark district which preserves buildings and artifacts of the Navy’s first shipyard on the U S west coast. Located in the cemetery are 6 graves of Russian sailors who died during the Russian fleet visit of 1863-64, and in a nearby part of the cemetery, two more sailors from the Russian ship Lena which was interned at Mare Island during the Russo-Japanese War of 1904-05. Of the 1863-64 graves three were originally marked by simple marble stones with rounded tops and Cyrillic markings. One theory holds that they were purchased and placed by the deceased mens’ shipmates. These markers, tipped and broken, were spirited away from the cemetery and stored in a private home until last year, when they were returned to a museum on the island. The other three graves were marked by stones of standard early VA issue and labeled, simply, “Russian Sailor”. The 1904 graves are marked with 3 foot granite crosses on granite foot-high bases. Some time last year, in a process that appears to have bypassed a statute requiring review and approval by the city’s Architectural Heritage and Landmarks Commission, markers in the 1904 style were stealthily placed over all six of the 1863-4 graves. The three extant VA stones were removed and stacked against a nearby tree. This grave stone swap out, and the manner in which it was carried out, has, needless to say, produced controversy. The more historico-preservationist oriented citizenry are calling for removal of the new markers and restoration /replacement of the old ones with historically accurate copies. On the other hand, some members of the local Russian-American community express the opinion that the old stones were decrepit and neglected and that the new ones show respect for the men over whom they stand watch. Do you have an opinion? Do you know people in the “cemetery community” who might be able to weigh in on this controversy? The city Commission is due to hold a hearing on the matter on 18 August. I’d like to bring the opinions of interested people and experts to the meeting with me. Write your comments and expert referrals in the Comments section, below. Finally, a word about “Subscriptions” to this blog. I notice that a few have signed up for this service, which automatically sends a notice to you whenever I put up a new post. Subscribing is easy: just utilize the “Sign Me Up!” button to the left of this post. Henceforth, you won’t miss a word from “Of Ships and Surgeons”. Sources for my reflections on the Battle of the Java Sea are: van Oosten, F C, “The Battle of the Java Sea (Sea Battles in Close-Up-15)”, Annapolis, MD, Naval Institute Press, 1976; and Thomas, David, “Battle of the Java Sea” (1968), Paperback edition, London, Pan Books, 1971. Idaho historian Gayle E Alvarez tells us that because of concern about “coastal bombings” at the onset of U S involvement in World War II, civil authorities sought naval training facilities well inland. (1) I’ve already written about the Naval Hospital associated with the training facility at Sampson in upstate New York (September and December 2010). The other site, chosen by a panel of three senior naval officers (a venerable myth holds that Eleanor Roosevelt suggested the site after she flew over the area), was at the south end of Lake Pend Orielle (“pond array”) in northern Idaho. Construction of the training base began in April 1942. A month later, President Roosevelt named the base after Civil War hero and the U S Navy’s first Admiral, David G Farragut. The base hospital, initially intended to care for recruits undergoing training, was commissioned 15 January 1943. Original construction provided for 44 wards of 46 beds (2024 patients) and several service buildings. Fourteen more wards and civilian care facilities came on line in the autumn of 1944. Late in the war, as training activity cut back, the hospital absorbed 1600 more beds in nearby Camp Bennion (previously a part of the Naval Training Center) to accommodate convalescents and neuropsychiatric patients transferred from other naval hospitals. From the outset, the hospital had an active surgical service. Up though the first half of 1944, 400 beds accommodated recruits receiving hernia repair, pilonidal cyst excision surgery, removals of sites of infection and similar relatively minor operations. Starting in the latter half of 1944, surgical bed capacity expanded to over one thousand, and the patients were almost exclusively servicemen wounded or injured in theaters of war. One ward was dedicated exclusively to patients suffering from severe chest wounds. In all, surgeons at Farragut performed more than 10,800 separate operative procedures from opening until a month after VJ Day. The historical review’s author was moved to comment “[s]tartling clinical pictures appeared in view of previous experience in traumatic surgery. One view gained was that of the magnificent task performed in the forward areas on the array of patients, who, judging by previous standards of treatment, should never have survived.”(2) He mentioned in particular patents suffering extensive boney damage who arrived in Farragut with minimal infection. The medical service of the hospital demonstrated a similar shift from acute infections (pneumonias, streptococcal infections, measles and mumps) among recruits until mid 1944, when the patient population gradually changed to consist mostly of chronic cardiac, lung, neurological and other diseases. The hospital commander remarked that the death rate from pneumonia was markedly less that expected, especially after the introduction of sulfa and penicillin therapy. Hospital authorities established a Hospital Corps School at Farragut. Initially commanded by the hospital commander, Captain Harry S Harding, Medical Corps, USN, it stood up on 4 January 1943. More than more than 17,000 Corpsmen passed through its portals before its 31 October 1945 decommissioning. Both the Naval Training Station and the Hospital were decommissioned on 15 June 1946. In October, the Farragut College and Technical Institute opened its doors and utilized most of the Training Station’s buildings. This educational enterprise mainly served veterans learning new civilian skills. By 1949, these educational needs had been met, and the facility closed in May, leaving the structures once more empty. Today, Farragut State Park occupies most of the Training Station property and only a handful of the original 667 buildings still stand. Among these is the Training Station brig, which serves as a small museum. (1) Alvarez, Gayle E, and Dennis Woolford, “Farragut Naval Training Station”, Charleston, South Carolina, Arcadia Publishing, 2009. 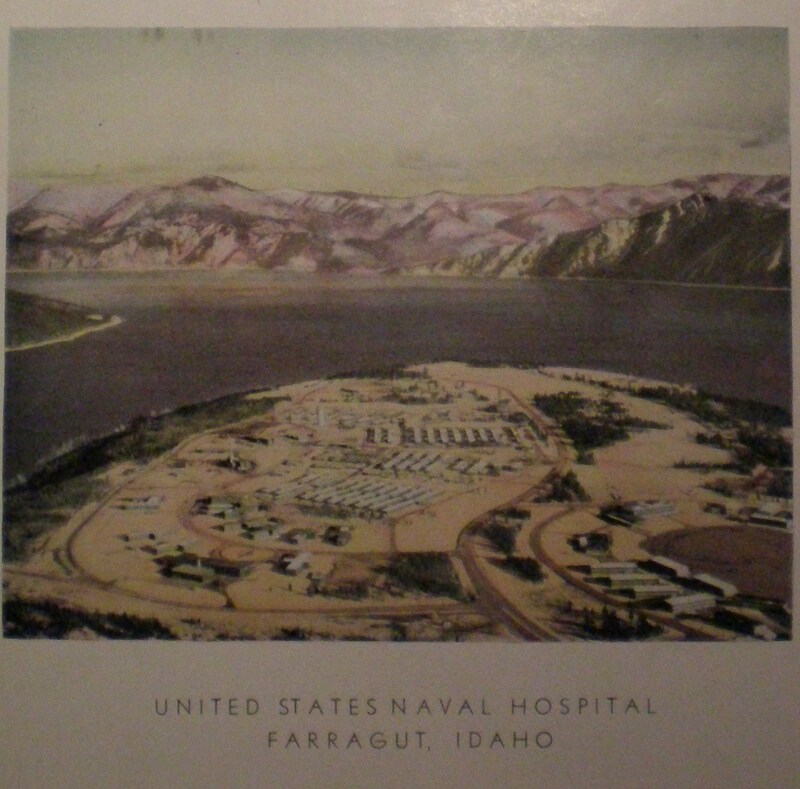 (2) “U S Naval Hospital, Farragut, Idaho-Historical Review”, typewritten,?1945. These notes are in the Historical Library, Office of the Historian, U S Navy Bureau of Medicine and Surgery, Washington, DC. This review bears no date of publication, but by taking clues from the text, I believe it was written in the last quarter of calendar 1945 or in the first half of 1946. While the document lists no author, the tone of some of the commentary leads me to attribute its authorship, or at least direct authority for authorship, to the hospital’s final Commanding Officer, Captain A C Smith, Medical Corps, U. S. Navy.